We’d love your help. Let us know what’s wrong with this preview of Remedy For Treason by Caroline Roe. To ask other readers questions about Remedy For Treason, please sign up. I picked this book upseveral years ago at my favorite used book store because historical mysteries are my favorite genre, and medieval Spain is a period I've never read about. I want to rush out and find the next several in the series! Blind Jewish physician Isaac is a very appealing hero - wise, logical, compassionate and kind; the back cover made it sound like he was always ducking his wife's temper which made me think for some reason it would be more humorous or slapstick - not at all. He is a I picked this book upseveral years ago at my favorite used book store because historical mysteries are my favorite genre, and medieval Spain is a period I've never read about. I want to rush out and find the next several in the series! At first I was awash in a sea of Spanish titles and a bit confused with the large cast of characters, but as with many of my favorite historical series (Brother Athelstan, Dame Frevisse, Prioress Eleanor, Matthew Shardlake), I've learned when the mystery is set among the great and powerful, it's best to sit back and be patient and the reader is well rewarded. True here, I am glad to say; after a slow start with the discovery of what at first appears to the body of a dead nun in the public baths and the subsequent launching of different aspects of a treasonous plot from several different points of view, the plot begins to coalesce around Isaac, his dear friend the Bishop of Girona and the royal family of Don Pedro, and the action just swept me along. I read most of the book in an afternoon during a looooong car trip. It is rewarding to read Caroline Roe at last. I was drawn to her books years ago. Several of these medical series volumes stood together, the covers uniquely gorgeous. It’s lucky I didn’t know they’re set in the 1300s. A medieval setting wouldn’t have appealed to me then. Revisiting my collection, I saw the author is Canadian, a pleasant surprise. My quest to fill in the few remaining volumes was quick and I tried “Remedy For Treason”. Something within these stories, I like at once. Some readers It is rewarding to read Caroline Roe at last. I was drawn to her books years ago. Several of these medical series volumes stood together, the covers uniquely gorgeous. It’s lucky I didn’t know they’re set in the 1300s. A medieval setting wouldn’t have appealed to me then. Revisiting my collection, I saw the author is Canadian, a pleasant surprise. My quest to fill in the few remaining volumes was quick and I tried “Remedy For Treason”. Something within these stories, I like at once. Some readers struggle with numerous personages and political detail. I too prefer the perspective of one or two heroes, never opposing parties. I think the difference Caroline makes, follows Martha Brooks’ advice: “Never tell a story. Show a story”! If you plough through the early cast of characters, you settle soon on those who charm us. Isaac, Raquel, Rebecca, and the bishop are my favourites. There was no sense of the author explaining life in 1300s Spain. We see their world for ourselves as events churn along. If ever there is an example of subtle acclimatization done well, here it is. It is also my impression that historical fiction is done well, if it doesn’t feel old fashioned. "Remedy for Treason" is set in the small town of Girona, Spain in 1353. Isaac, the blind Jewish physician is asked by the Bishop of Girona to investigate why a nun died in the public baths. Along the way we meet his family and a young Moor (Yusef) with a very big secret. Medora Sales who writes under the pseudonym of Caroline Roe has a PhD in medieval history and this makes for a rich, evocative tale. Isaac is a very intelligent if introspective man and this along with his strong moral compass make him a perfect investigator (in the eyes of the political Bishop of Girona). They very quickly determines that the woman who died isn’t really a nun because she still has her long red locks and no nuns have gone missing from the local nunnery. She is in fact one of the Queen’s attendants in disguise. No one seems to know exactly what she was doing or how she ended up dead in the baths but Isaac is suspects he has stumbled across a conspiracy to bring down the monarchy. Although I enjoyed all the characters, I very quickly developed a soft spot for the cheeky Yusef. He has undergone significant hardship and tragedy in his short years. Others would have been crushed by it but he has emerged as a resourceful and determined boy. Watching him find his place in Isaac’s household was delightful. If you are in the mood for fast action, then you really need to look elsewhere. The pace is leisurely and the mystery is interrupted by flashbacks, realistic religious tensions and Isaac’s domestic dramas. Isaac’s investigative technique involves questioning people, meditating on the information and carefully forming a hypothesis. With a book like this, the journey to the solution is far more important than the solution itself. I had read book #2 before #1, so this book really helped to set the setting. The story takes place in 1353 in Medieval Europe. It is quite complex, paced in a balanced manner, with very good development. I love learning about the social history of the time especially and the details of the Jews (I am Jewish) in that area in Girona, relatively close to Barcelona. I would give it a 4+ if I could and I highly recommend it. The first (I think) of a series of books starring a blind Jewish physician and his Muslim apprentice in 14th century Spain. In addition to being engaging mysteries, these books, which are written by a medieval historian, provide a fascinating glimpse into medieval Spain. Excellent premier volume de la série Chroniques d’Isaac de Gérone, cette entrée en matière donne vraiment envie de lire la suite des aventures et enquêtes d’Isaac le médecin. Le contexte historique est passionnant et bien reconstitué, ça change et dépayse, l’intrigue est bien développée, les personnages intéressants. À découvrir ! After reading all the reviews for this book (all of which gave it a much higher rating than I do,) I was expecting something far more erudite and historical. The evil characters hardly play any active role; once revealed, they are killed or leave the stage the story is built on. The good characters move about in a haze of either obliviousness or obtuseness until something occurs to shake them into taking notice of what is going on around them! I cannot really believe that in mid-14th century Spai After reading all the reviews for this book (all of which gave it a much higher rating than I do,) I was expecting something far more erudite and historical. The evil characters hardly play any active role; once revealed, they are killed or leave the stage the story is built on. The good characters move about in a haze of either obliviousness or obtuseness until something occurs to shake them into taking notice of what is going on around them! I cannot really believe that in mid-14th century Spain there were no political or social tensions between Jews, Christians and Muslims, but that is the way it is presented and the reader is supposed to buy it. It would be lovely to think that they were so enlightened at that time, but I'm afraid genuine history shows us that life was far more fraught than this book would have us believe! As for the plot, it was vague in the extreme and by the time the murderer shows up, I frankly didn't care anymore! There is supposedly an uprising afoot to replace King Pedro with his brother, Don Fernando. Some discontented citizens are involved, sort of, there are plans to do away with the whole royal family, beginning with the kidnapping of the King's toddler son. The Queen never makes an appearance at all, so any conjectures as to her death are baseless. The King seems surrounded by incompetent, disloyal retainers...maybe there should be a rout of his personal guards! There are deaths, but they are mainly of people the world is well rid of, so no one is overly anxious to get to the root of the problems. There is a love story, but the male party is so clueless that one wonders what the female party could possibly see in him! This was a nice departure from what I have been reading lately. Well not a radical departure as it is a historical mystery, but it is the first I've read by an outsider. Caedfael, Owen Archer, Eleanor and Thomas and all the rest, while set apart in different ways, were all European. Isaac of Girona on the other hand is part of a society viewed with suspicion by the greater society around him. As a doctor, and a good one at that, he is instrumental to his town, but as a Jew he is viewed with susp This was a nice departure from what I have been reading lately. Well not a radical departure as it is a historical mystery, but it is the first I've read by an outsider. Caedfael, Owen Archer, Eleanor and Thomas and all the rest, while set apart in different ways, were all European. Isaac of Girona on the other hand is part of a society viewed with suspicion by the greater society around him. As a doctor, and a good one at that, he is instrumental to his town, but as a Jew he is viewed with suspicion even by those he is friends with. The bishop is his closest friend in this book and even he suspects Isaac of magic. Very engaging, thoughtful, well plotted historical fiction set in 1300's Girona. Captures the politics, religion and way of life of several intersecting cultures in medieval Spain. Disappointing though mildly interesting---about a blind Jewish doctor in the 14th century, his spunky daughter/student, and a plot against the king. An interesting idea, hero and setting are hurt by a major case of 'first book in the series' syndrome. I like Isaac and the members of his household, but the story jumps around too much and we get information that he doesn't, so it feels like I'm cheating when I pieced things together before he did. The jumping around between three story threads and a dozen characters in a book that's a little over two hundred pages really hurt it. I was expected to keep track of thinly developed characters, whil An interesting idea, hero and setting are hurt by a major case of 'first book in the series' syndrome. I like Isaac and the members of his household, but the story jumps around too much and we get information that he doesn't, so it feels like I'm cheating when I pieced things together before he did. The jumping around between three story threads and a dozen characters in a book that's a little over two hundred pages really hurt it. I was expected to keep track of thinly developed characters, while the 'detective' spent too much time off stage. Really wish the focus had stayed more on Isaac and the author had found a better way to give us information than wandering off. A good lead character and an interesting bit of history, but otherwise an uneven book that has me feeling lukewarm about giving it another try. The first line of the Synospsis should give you an idea of the historical accuracy to be expected: Girona, Spain 1353. In 1353, Girona was not part of Spain but of the Crown of Aragon. Not only that, but Spain did not even exist, with the peninsula beign divided into the Crown of Aragon, The Crown of Castilla, Navarra, the Califate of Cordoba and Portugal. But who cares about historical accuracy? Not this writer apparently. First of her Isaac of Girona series. Isaac is a blind Jewish physician in 14th century Spain. I enjoyed this and would welcome another; I have to say it wasn't, I don't know, deep maybe? I did like the characters and the plot ticked along nicely, I can't quite say what I thought fell short, but it wasn't very short anyhow. The mystery itself I'd only give 3 stars, but as historical fiction, the setting and characters were excellent. I was fascinated by the interplay of cultures in 14th century Spain. Well-written enough that I've read several others in the series - and want to read more! This excellent series, by Caroline Roe, is about a blind Jewish physician in medieval Spain. They are presented as mysteries, but as one Amazon.com reviewer mentioned, they are really more like historical novels than mysteries. I have enjoyed all of her books so far. What a fantastic first book to a series. I love that it is set in fourteenth century Spain and that the main character is a blind Jewish doctor. While the mystery was good, it was really the setting and the hero that made this such a good story for me. I enjoyed this one more than my husband, Travis, did. I found the setting and characters intriguing, though Yusuf's flashbacks were a bit heavy-handed. I am looking forward to more of this series. 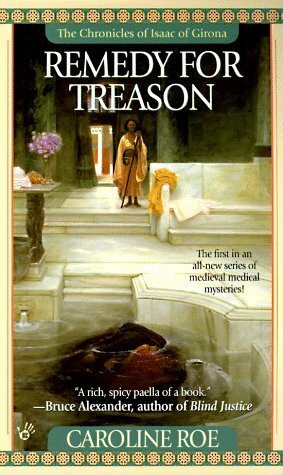 The first in a medieval medical mystery series that is good. I hope the series gets even better. Would a merchant in medieval Spain use the phrase I’ll box your ears?